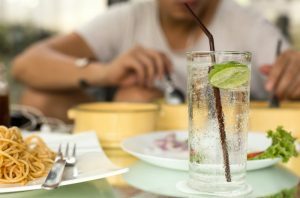 Enjoying an ice-cold beverage on a hot day takes on a different meaning when you suffer from tooth sensitivity. That cold beverage may be causing a painful twinge every time you take a sip causing you to avoid your favorite beverages and treats. Why are your teeth so sensitive? Your Park Slope dentist has the answers you’re looking for. While tooth enamel is one of the hardest substances in your body, it can actually wear down over time due to vigorous brushing. Toothbrushes with hard bristles are often the culprits of enamel wear. Be sure to brush gently and choose brushes with soft bristles. You might also consider switching to an electric toothbrush, which does a lot of the work for you. Foods and beverages that are highly acidic such as coffee, wine, and marinara sauce can also contribute to enamel erosion. If your tooth is fractured or compromised, it can cause sensitivity. Your dentist may be able to repair your tooth with a dental filling or crown, which will eliminate sensitivity. Dental restorations may also breakdown over time. A filling that is leaking or a crown that is fractured may be the cause of your sensitivity. Your dentist in Park Slope can discuss options for repairing your tooth with you. Gum disease or vigorous brushing can cause your gums to recede. This may expose your root, which can lead to sensitivity. Dental bonding, porcelain veneers, or gum grafting surgery are different options to eliminate root exposure depending on the severity of your case. Clenching and grinding your teeth at night can also cause enamel and tooth wear, leading to tooth sensitivity. Your dentist may recommend a night guard to wear while you sleep, which relax your muscles and protects your teeth from the damage that bruxism causes. Talking with your dentist is the first step to effectively managing sensitivity. Once the cause of your condition is determined, your dentist will have recommendations for the best treatment for your needs. Don’t let tooth sensitivity keep you from enjoying the foods and drinks you love! Contact your dentist to learn more about eliminating sensitivity. Dr. Frank J. Sapienza has been caring for patients in Park Slope for over 30 years. Patients enjoy the spa-like experience they receive when they choose us for their care. The comprehensive dental services available and exceptional service you receive at The Dental Spa of New York is beyond compare and unlike what you will find at most practices. If you would like to contact Dr. Sapienza, he can be reached through his website or by calling 718-965-6298. Comments Off on Why Are My Teeth Sensitive?